Netscan attended the EuroCloud awards 2015 in London on July 2nd, and are delighted to announce that we were awarded the ‘Highly Commended’ award for the ‘Best Cloud Facilitated Innovation’ (for the new nativespace range of ‘Mission Critical Hosting’ packages). Netscan also achieved the runners-up spot in the ‘G-Cloud Outstanding Newcomer’ award – a great achievement considering the excellent national competition. 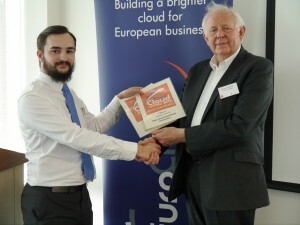 The photograph shows Simon Lawrence (Netscan’s Quality Manager) receiving the awards from Dr. Richard Sykes (UK Vice-Chairman of EuroCloud Europe).